Flash back a few days to me scrolling aimlessly through Facebook. My attention was caught by a sweepstakes to win a designer wedding gown, and not just any designer, but Monique Lhuillier, for the love of all things white and lacy. Of course I clicked the link to enter, and I realized that all I had to do was start a wedding registry with what happened to be one of my favorite home-good stores, and I was in the running for my dream gown. (Mind you, I couldn’t currently tell you the name of a specific Monique silhouette that I love, but that is beside the point. I have never won anything; this just seemed like a great way to avoid homework. There, I said it). Seeing as Paul and I are at about the time frame when we need to start a registry, I figured, “why the hell not?”, “How hard could it be?” I thought, as I dove into casual dining collections, bakeware and cookware, cutlery, and bathroom essentials. Not going to lie… three or four pages in I started to freak out and found myself reaching repeatedly for my glass of wine. Did we really need new measuring cups? What about fine china? How many place settings? I HATE gravy! Will I ever need a gravy bowl? Where do I even start? “Start with what you know” I found my own PR voice in my head whispering as I tapped a finger on my wine glass. 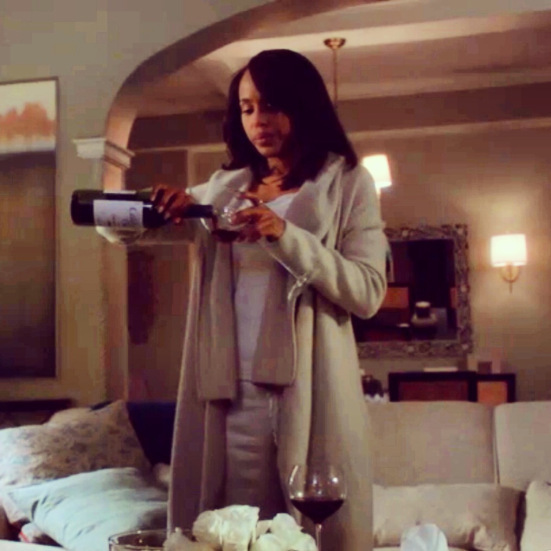 Olivia Pope wine glasses. Wine. Solves. Everything. Many people seem to think that getting married is some sort of gateway into adulthood. False, my friends. In fact, I feel less like an adult, because I have someone else who is technically responsible for my well being. Guess who is going to make sure I make it to the end of the day alive? My hubs. Not that I am taking this as an excuse to be reckless, but the immature side of me feels like now I have a tag team member to be twice as immature with. Just because I am getting married does not mean that I know how many place settings I am going to need or what all those insane torture devices are in the baking section of Bed Bath and Beyond. I haven’t grown up; it just means that I have found someone who legally wants to be bound to my childlike ways. In the mean time, let it be known that the first thing that I registered for were red wine glasses, a la Olivia Pope… followed by champagne flutes. Eight of each, because that just sounded good. I can grow up next year 🙂 And I will ask Paul about the gravy boat. He likes gravy.